​​Catherine loves to do portraits, illustrations, drawings of people around the world, and drawings and paintings of animals and nature. 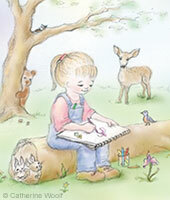 She enjoys working with graphite pencil, pastels, color pencils, and watercolor. One day a while back, someone saw a portrait painting she had done of an adult. They asked her to paint their grandchild. Since then children have been her favorite subjects. Children with animals, even more so. Catherine is very thankful for having had the opportunity to illustrate a couple of children's books, including, most recently, A Postcard from Gilman's Corner, a free flip book eBook. For more information and to read the book, please see the Books page under the Artwork menu.